It was wonderful to have the opportunity to take some outfit pictures on the weekend because I’ve wanted to show you these pieces for awhile now. I also have a set of photos with my new light blue coat which I’ll post soon. For now I’ll leave you with a preview featuring the fabulous kitty cat print lining. 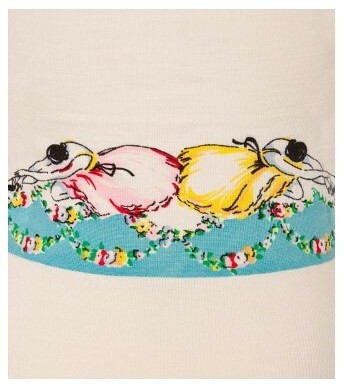 As we all know I have a rather extensive cardigan collection (since I find Alannah Hill cardigans irresistible), but of all my cardigans this is probably the most unique. I’ve rarely seen anything so pretty, delicate and original. The sweet little ballerinas are beautiful, as are the exquisite buttons. I like to think the rest of my outfit displays subtle elements of the ballerina theme through my signature hairstyle and my skater skirt. 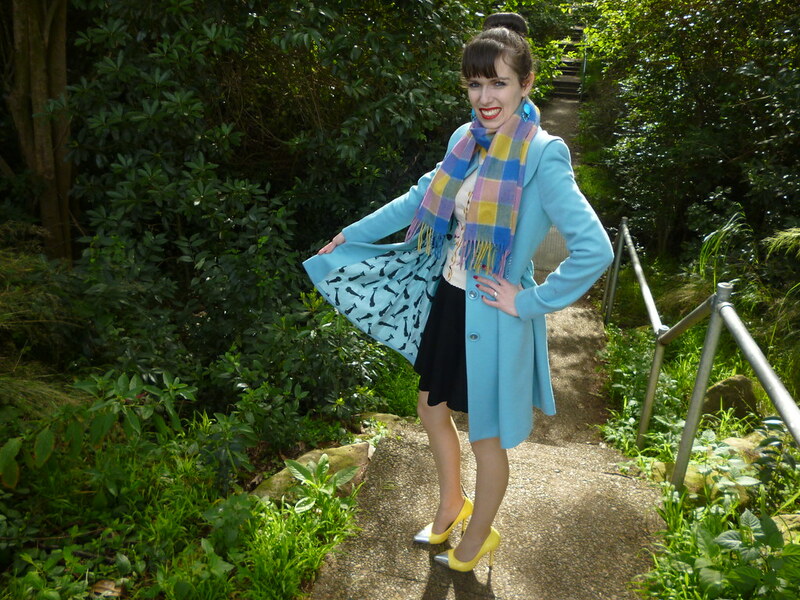 In accordance with my recent love for both yellow and duck egg blue, I thought it would be fun to style this cardigan in a way which brings out those colours. 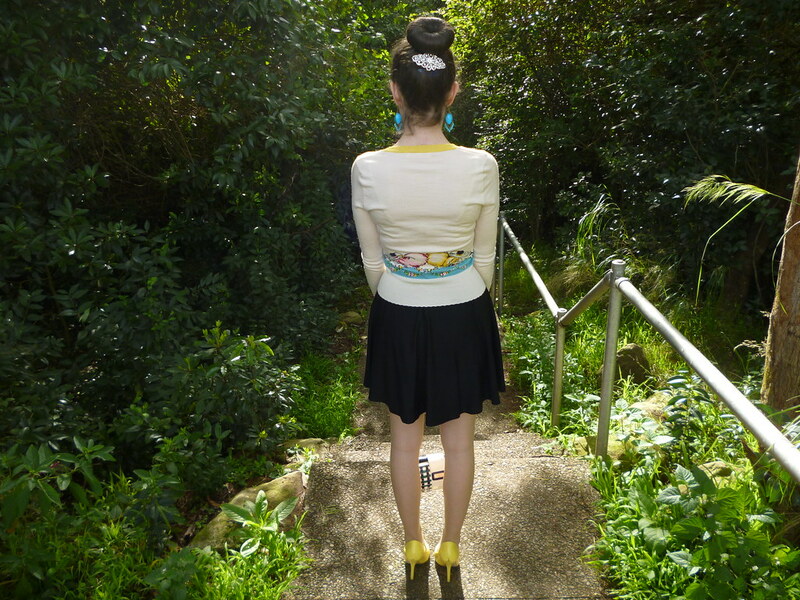 My outfit seemed completely transformed when I highlighted the yellow by wearing these amazing heels.They have proven to be one of the most popular items in my wardrobe, ever since my sister bought them for me last Christmas (posted here). My lovely earrings which I received courtesy of Spark Jewelry complement my cardigan. I’m very happy with these statement earrings and I intend to wear them on multiple occasions. I’ll probably wear this outfit, in its entirety, to work on Friday. I’m finding that my wardrobe fits so well with te workplace; and if there is ever an outfit which excessively pushes the boundaries, I’ll save it for casual Fridays. Work is going well. It has changed my whole life in the best possible way. It’s provided me with positivity and life direction, and self belief that I’ve so desperately been lacking for many years. I’m so lucky to have found this particular job: I never expected to like it this much. Even though a life involving work, travel and sleep is exhausting, it is all worth it. There is still a lot to learn but this is the most motivated I’ve felt for years. I’ve never been more grateful for an opportunity in my entire life; it means the world to me. I’ll write about my job more in up coming posts, but for now I must have some sleep. Goodnight all! 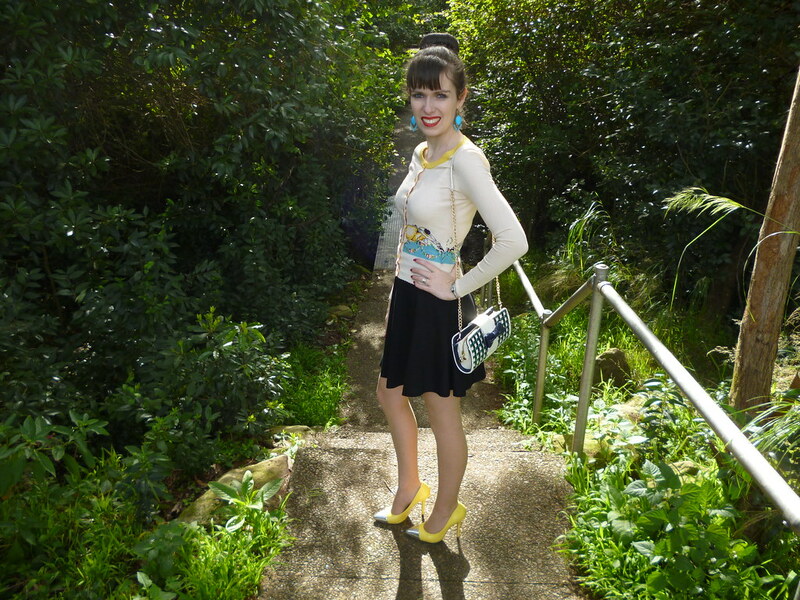 This entry was posted in Alannah Hill, Dangerfield, Outfits. Bookmark the permalink. Loving the shoes! Good golly it has been FOREVER since I have worn pumps. Like junior high forever! Yes, the cardi is so delicate! I liked the way you wore it, with those amazing shoes and pretty skirt! The new coat is so sweet – such a lovely color indeed! I am glad you found your path in life, it's so important and I must confess… I am still looking for mine! I love this outfit… great color combo, as always!!!! You are so gorgeous and your outfit so absolutely stunning and elegant! Love the cardigan! I've said this before and i say it again You have the best collection of cardigans, they are all just awesome. Beautiful outfit! I love the coat! So cute! I love blue and yellow together. Those shoes are great! Super cute. Love the sweater. Cool post! I love your '6o outfit! that skirt and those shoes, wow! Cute to boot! Very nicely vintage-inspired. Such a pretty photo shoot and love the blue coat. Can't wait to hear more about the job that is making you so happy.